Standard Saddle Armrest Bag Large single pocket bag that mounts to most any wheelchair armrest or scooter armrest. 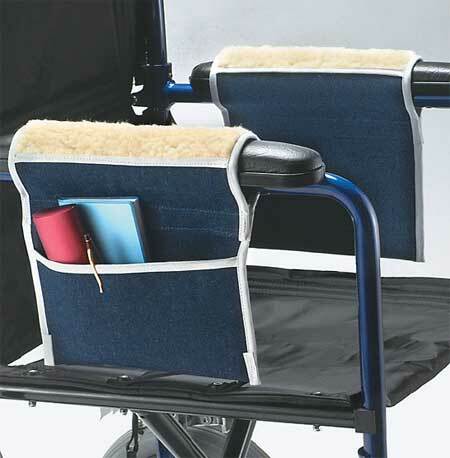 Large single pocket bag that mounts to wheelchair or scooter armrests. 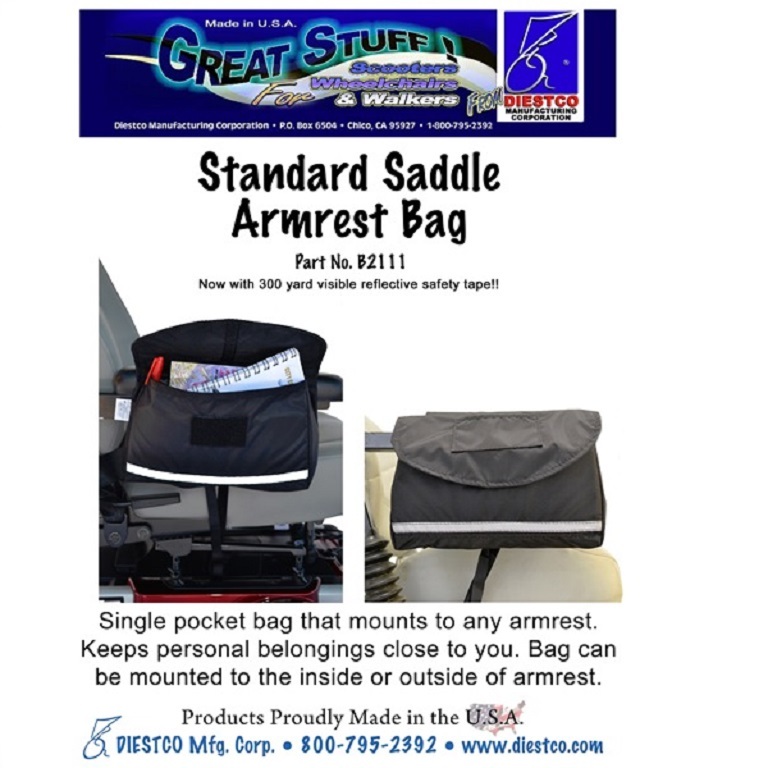 The Standard Saddle Armrest Bag is a large single pocket storage bag that mounts to most any wheelchair or scooter armrest. 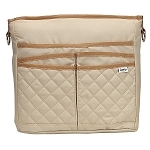 This accessory bag is ideal for keeping personal belongings close. 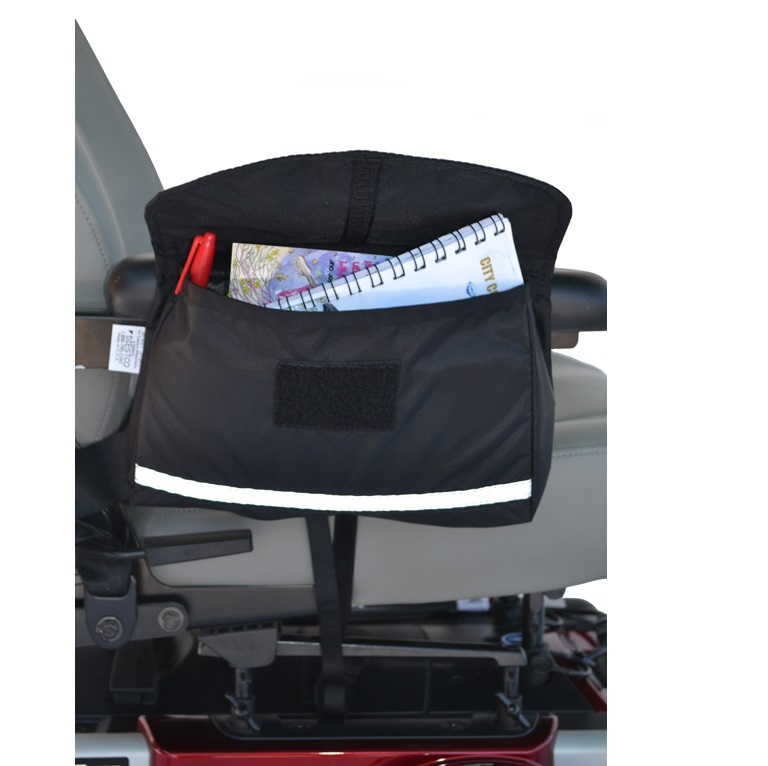 The Standard Saddle Armrest Bag straps over a scooter or wheelchair armrest to provide a handy storage area for keys, wallet, phone, glasses, or other personal items. 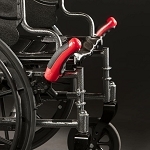 This durable nylon bag attaches to most armrests using unique "soft to the skin" mounting system. To attach, wrap the fabric with the soft hook material over the top of the armrest and secure it to the loop strap. 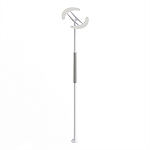 The soft material allows your arm to move over the armrest without discomfort or skin irritation. Use the smaller hook and loop strap attached to the bottom of the bag to secure it to the seat post or frame and prevent the bag from swinging. 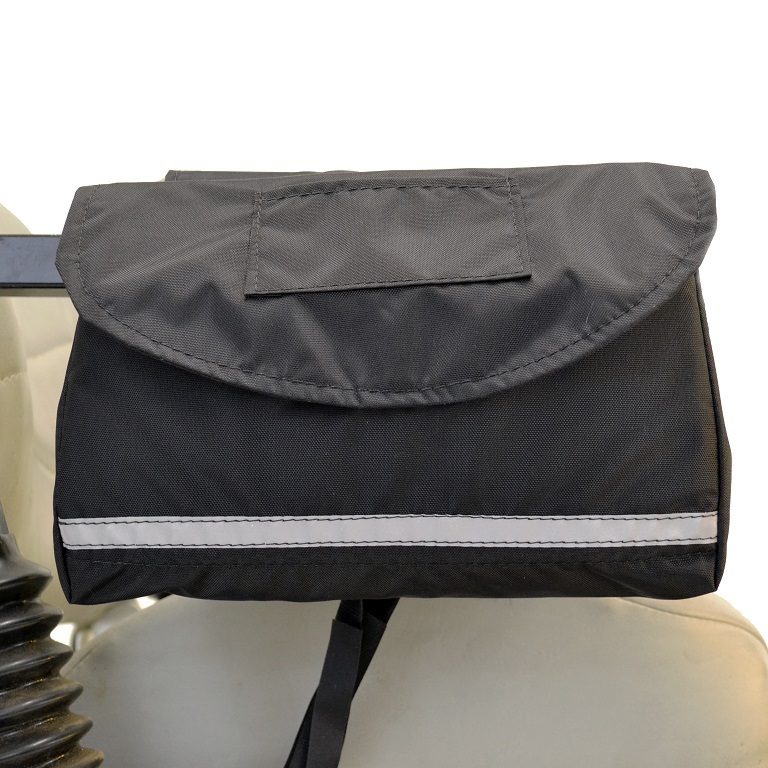 The Standard Armrest Saddle Bag can be mounted on inside or outside of scooter or wheelchair armrest, from 1 inch round tubing to deluxe scooter armrests. The armrest bag measures 10 inches wide, 8 inches long, 3 inches deep. 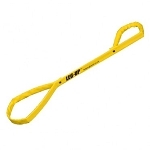 Measures: 10 inches wide, 8 inches long, 3 inches deep. Material: High quality water resistant nylon. 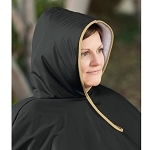 Its ok, but it is much smaller than it looks in pictures and has only one pocket on the outside which is too small to put anything into it. 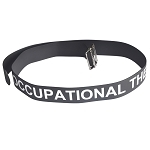 I bought this for my husband who is in a nursing home with a stroke - he loves it! He is paralyzed on his left side and I attached this (easily) to his right side of his electric wheelchair.. This bag works great. Fit on my wheelchair perfectly! Bottom of bag a flimsy material. Would like to have a shorter debt so it doesn't rub on wheels of wheelchair. Wonderful this is my second one. I had one on my jazzy that went over the armrest. I got a new Permobile F3 and fits under the armrest that protects it from snagging on doorways. Q: Will this bag fit on a manual wheelchair such that it will not rub on the wheel? A: To make sure the bag want rub your wheel, measure from the top of the armrest to the top of the wheel. The armrest bag measures 10 inches wide, 8 inches long, 3 inches deep.